Ford versus Holden, the definitive Australian automotive rivalry, seen here but not as we know it. There’s not a V8 engine, a sedan body or a rear-wheel-drive configuration in sight. Instead, we have a pair of hot hatches, both (re)launched inside the past few months, that go about doing broadly the same thing as each other in notably different ways. The five-door Ford Focus ST was introduced in updated form just last month with re-jigged suspension and a vastly improved cabin but, vitally, the same price tag. The three-door Holden Astra VXR launched in April, though we’ve seen it here before, as the short-lived Opel Astra OPC that sold here for just 11 months until mid 2013. Despite their differences, this pair have a number of things in common. Both cost a shade under $40K, both have 2.0-litre turbocharged petrol engines matched to six-speed manual gearboxes, both are front-wheel-drive and both are made in Europe (Germany and Poland respectively). Both have a formidable list of rivals to compete with, the obvious two being the Volkswagen Golf GTI (Ford) and the Renault Megane RS (Holden). But the time we spent in each of these cars left us with no doubt they have what it takes and more. Both of these cars are sharply priced for what you get, but it’s the five-door Ford that strikes the first blow against the three-door Holden. At $38,990 plus-on road costs, its three-grand cheaper than a less-powerful manual Golf GTI. The Astra VXR commands a $1000 premium at $39,990 plus on-road costs, though when it wore Opel Astra OPC badges here it cost $42,990. This new mark also undercuts the entry Renault Sport Megane RS265, which is presently retailing for $43,990 drive-away. Both come with a solid list of standard equipment, including sports bucket seats, satellite-navigation, advanced multimedia systems with in-built digital radio and USB/Bluetooth compatibility, auto dusk-sensing headlights, dual-zone climate control, daytime-running lights and sporty silver bits on the kick-plates, pedals and scattered around the cabin. The Ford has the superior display (pictured above) — an 8.0-inch touchscreen — with the Sync 2 infotainment system, which is as up-to-date as you can get in Australia. The Holden’s 7.0-inch unit has the latest MyLink system but no touch-operation. The Ford is also the only car here with keyless start and a spare wheel, albeit only a space-saver, and offers a reverse-view camera unlike the sensors-only Astra. The Holden (pictured below) counters with standard Nappa leather, heated eight-way adjustable seats (the Focus’ Recaros are half-cloth and adjust manually, but they don’t have the excellent seat bolster adjustment that the VXR does), a tyre-pressure monitor and rain-sensing wipers. Holden also chucks in a set of VXR front and rear floor mats, and its 20-inch wheels are larger than the Ford’s 18s. Only the Astra gets adjustable dampers, and it has bigger front brakes by Brembo, a mechanical LSD and much more expensive Michelin Pilot Super Sport tyres. On the safety front, both get six airbags. Our test Focus had the $2000 Tech Pack, that adds Active City Stop, Blind Spot Detection, Rear Cross Traffic Alert, Lane Keeping Aid, Lane Departure Warning, Driver Impairment Monitor and Auto High Beam cornering headlights. We’re hesitant to reward a car without a reversing camera, but the Astra is probably still the better-equipped car here. Any sub-$40K with those seats, brakes, adjustable dampers and track-ready tyres is good value by most measures. The $40,990 Focus ST with Tech Pack is nothing to be sneezed at either, and it has five doors. Call it a tie, then? Obviously, the biggest difference here is the extra set of doors you get with the Focus. The rear seats aren’t as roomy for knees and heads as in some other small hatches, but it’s clearly the more practical offering of this pair. Rear occupants sit on seats with good support, and get nice leather-lined contact points, their own central map lights and good door pockets. There are no rear air vents or traditional cupholders, and there’s no ski port. The Holden’s rear seats are, of course, harder to access, but there’s decent space on offer and they are at least made of high-quality leather. As with the Ford, you get good door pockets and two ISOFIX anchors for child seats, though access in the Astra is via a latch that flips the front seat forward. It’s a narrow aperture. In both cars, the rear sits flip-fold 60:40. The Focus offers the superior boot layout with a lower loading lip. The companies claim cargo storage capacities of 316L (Ford) and 380L (Holden), but the Ford oddly has a more useable space with a lower lip. There’s a space-saver spare under the Ford’s loading floor, but only a repair kit in the Holden, despite the existence of a cutout for an emergency tyre. While it’s the Astra that perhaps wins on the level of specification offered, it’s the Ford that has the better-resolved cabin. The newly launched redesign clears up the old car’s clutter, with most buttons banished, and their functions shifted to the aforementioned 8.0-inch touchscreen. The Sync 2 multimedia system works via a touch-operated home screen consisting of four main quadrants for sat-nav, audio, climate and telephone. The Bluetooth re-pairing is rapid, the voice recognition excellent (it adjusts the air-con, and understands conversational direction delivery) and the overall speed and ease-of-use is good. The design is clean, and the materials feel high quality. The silver inserts feel more expensive than the Holden’s, the plastics on the dash and stalks of a better standard, and the digital readout for the climate control and the superior trip computer display gives a feeling of modernity. The Ford’s dashtop oil and boost gauges are a novelty, but a fun one. The Holden’s fascia, an aged design dating to 2009, is a mess of buttons and dials. You’re greeted by a formidable wall of plastic buttons that takes some acclimatisation, and while you get the latest MyLink software, there’s no touchscreen. Navigating menus or entering an address via the dials is a pain in the neck. The plastics on the lower dash, the transmission tunnel, and the indicator/wiper stalks, also feel lower-rent, while the silver plastic ringing the dials looks cheaper than it should. 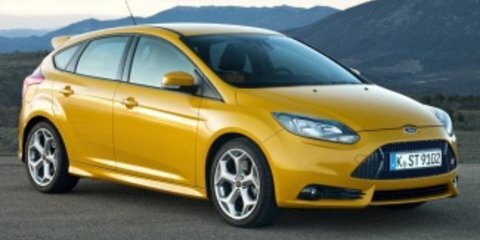 The Ford’s manual park brake doesn’t really impact storage up front, with the Focus matching the Astra for cup-holders and console size. Both cars have nooks in which to store your phone/wallet, and good door pockets. Both cars get silver kickplates and pedals to a sportier feel, but the Ford’s gear-shifter and decals are much more tasteful than the Holden’s. The Astra’s wheel is a better size than the Ford’s oversized, spongy tiller though. The Holden also has superior seats. Designed by Opel, they’re leather-lined, heated up front and the driver get electric bolster adjustment (both for the thighs and your sides). They’re absolutely brilliant, and make up for the huge reach-around to fetch your seatbelt. The Ford’s cloth-lined (leather-bolstered) Recaros hug you like a bear on-track, but they’re a little narrow for larger drivers, and perhaps for the day-to-day. They lack the Astra’s adjustability. All told, the Astra’s superior seats aren’t enough to eclipse the Ford’s superior cabin ergonomics, more tasteful design, feeling of quality and ability to carry five in greater comfort than the Holden courtesy of its rear doors. Both cars get 2.0-litre direct-injected, turbocharged petrol engines sending power to the front wheels exclusively via six-speed manual gearboxes only. No automatics here. It’s the Astra that takes the honours for power and torque. Its engine makes a potent 206kW at 5300rpm and 400Nm of torque between 2400 and 4800rpm. The Ford’s produces 184kW at 5500rpm and up to 360Nm between 2000 and 4500rpm. So the Ford has less power/torque, but delivers the latter earlier. There’s also the fact that the Focus is 85 kilograms lighter than the Astra, narrowing the power-to-weight ratios. Both engines also make a great racket. The Astra emits a raspy, jet-like roar above 3500rpm and offers a meaty and menacing burble at idle. The Ford sounds tame from outside, but a sound actuator sends artificial nose into the cabin that makes your experience more visceral. It’s a love or hate thing, and I lean to the former. Honestly, both of these cars pull like a train down low and scream happily out past 6000rpm until you’re bouncing off the rev limiter. The former trait gives both sublime in-gear acceleration, making each exceedingly rapid point-to-point. If we have to split them, we’d say the Ford is a touch more tractable and flexible. As the outputs suggest, the Astra has ultimately more punch, but the Focus offers you maximum torque earlier in the rev band. We left the Ford in third gear happily in some areas where we’d downshifted the Holden. On that note, down-shifting in the Holden is less fun than the Ford. For that matter, shifting in general. The Astra’s six-speed manual has a longer throw and a less precise feel than the crisp unit in the Focus. Shifting in the Ford is a joy. However, power delivery off the line is better in the Astra, thanks to its clever front struts that limit torque steer and its comparative lack of axle tramp. The Ford’s tyres are inclined to either axle tramp or simply spin if they don’t get purchase. You have to tread a finer line to get the perfect take-off. This is reflected in the figures captured on our V-Box — the Astra VXR’s 0-100km/h time was 6.5 seconds on the first try (and we didn’t improve on it), while we eked a 6.8s from the Ford. In daily driving, both engines feel suitably refined and smooth, and can be coaxed into providing good fuel efficiency of 7.3L/100km (Ford) and 8.0L/100km (Holden), though both prefer 98 RON petrol. The clutch pedal feel in both is ideal for stop-start driving, given both have good take-up points. Both cars also have relatively smooth idle-stop systems that you can opt out of. There are two of the sharpest front-drive hot hatches around, though the Renault Megane RS 265 would no doubt pipe in with a pointed ‘excusez-moi?’ if we were to anthropomorphise it. Both are rapid point-to-point, but also more than capable of tackling a twisty road if you’ve the inclination. Being front-drive, the emphasis is on controlling your entry speed to limit understeer, turning-in a little early, and transferring weight to the nose through braking. Both cars are impressively nimble and quick to carve up ribbons of road, though they feel suitably different. It’s the Holden that feels more tied down, a by-product in large part of its brilliant and super-sticky (read: expensive) 245/35 Michelin Pilot Super Sports. Throw in weightier steering as well. Nevertheless, it’s the Ford’s steering that is more fit-for-purpose. It’s notably lighter, but the reactions are sharp immediately off-centre and there’s a fast ratio (1.8 turns lock-to-lock), giving you scope to make constant minor adjustments as dictated by the chatter you get from the 235/40 Goodyears, which aren’t at quite at the same standard as the Holden’s. We also noticed some mid-corner kickback through the Holden’s wheel on the bumpy roads of the Reefton Spur. But if we’re going to, err, kick the Holden for that, we’d better point out the Ford’s ludicrous 12.0-metre turning circle. The mark of the Astra’s body control is how flat it stays in the corners, and the kinds of eye-watering velocity you can carry right through them with total confidence — eroded only by those oversized A-pillars that limit forward visibility. It feels planted, something amplified by its 40mm wider rear track and fatter tyres. The Drexler mechanical limited-slip differential clearly does its job redirecting torque too, because the grip levels and the direct-ness aren’t a sole by-product of the tyres. If you do get a little loose, the Holden’s stability control system has an excellent calibration, given it interjects gently. Also reassuring are those monstrous Brembo brakes (only at the front), which are as good as it gets in this price range. But again, for all the excellence of the Holden, the Focus goes about its business in even more entertaining fashion. It feels lighter and more nimble, particularly over the front wheels, aiding turn-in. It tips the scales at 1425kg dry; the three-door Holden is 1510kg. Ease off the throttle, and a combination of the weight transfer to the front and away from the independent rear suspension with control blade, and the inherent chassis balance at play will give you marked lift-off oversteer. The Ford won’t snap or spit you off the road, but this factor, plus that quick steering, make it a car that demands concentration. You can carry as much pace — possibly — more in the toweringly competent Astra, but will your smile be as wide? Of course, the less polished brake and tyre package — outlined in detail here in David Zalstein’s track-day feature — means the Focus never feels quite as confidence-inspiring at the limit, though the torque-vectoring system does what it can. In addition, a swift take-off is more fun in the Astra (as well as faster, as mentioned earlier in the engine and transmission section). The Holden’s HiPer Strut setup at the front that allows the Astra’s wheels to turn independently of the suspension strut, keeps torque steer at bay. Simply plant your boot, ease off the clutch and go. The Ford is more of a handful at take-off. It doesn’t have the Focus RS’ RevoKnuckle system up the front, so you’re immediately going to deal with the signature tugging attributable to torque steer. The tyres lose traction earlier, too, but if they manage to grab you’ll get the kind of axle-tramp the VXR banishes. The Astra has more liveable ride quality of the pair too, given its FlexRide lets you adjust the dampers to three settings. In Normal and even Sport mode you would never suspect you were rolling on 20s, because bump absorption is commendable. The hardest VXR mode will rattle your fillings out, but will also stiffen up the chassis (and improve throttle response, while making the dials glow and angry red). The Ford’s one-size-fits-all setup is firm, feels more skittish and offers less insulation from the forces the shoot into occupants’ bums over rapid-fire corrugations such as those each side of tram lines. It’s also about 1.0 Db louder at 100km/h than the Holden, according to our meter. One stray observation of the Holden we’ll throw in is the super-low rubber bit below the chin spoiler that scrapes over everything. Again, these are two extremely talented cars. The Holden’s simply great tyres and brakes, its clever front struts, LSD and its adjustable dampers make it a car that you can drive very very fast, very very comfortably. It’s also quieter and more cushy day-to-day. But the Ford’s livelier and more playful handling, and more engaging and quicker steering, make it a greater challenge, and thereby render it more engaging. For me, at least, that’s hot hatch 101 — be engaging at all costs. Ford recently expanded its capped-price servicing plan to cover the lifecycle of its vehicles. Each service has 12-month/15,000km intervals, and at current pricing five of the first six visits are pegged at $330 (the fourth is $475). Ford’s new vehicles also come with seven-years/105,000km of free roadside assist, and there’s also a separate capped-price brake pad replacement program. All customers also have the option of booking a free loan vehicle during every scheduled service or warranty claim. Any private customer or Blue, Silver or Gold fleet member is eligible to book a free loaner. Ford’s new-car warranty is unchanged at three-years/100,000km. 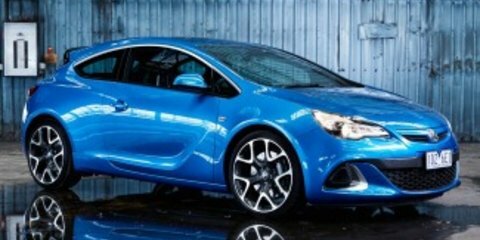 As with all Holden models, the new Astra VXR will be covered by a capped-price service program for the life of the car. Intervals are nine-months/15,000km, though each is cheaper than the Ford (the first six are either $229 or $289). The VXR is also covered by a three-year/100,000km warranty, and a year of free roadside assist. The great news is, both of these cars are outstanding. The fact the Astra remains as good as it is is testament to a fine design, and the amount of power and grip you get for the money. There’s an element of class and dynamism here missing from other imported Holdens, and the VXR is an excellent option for a prospective three-door hot hatch buyer not enamoured with the uncompromising, if preternaturally talented, Megane RS. But it’s the Focus ST that brings home the win for the Blue Oval Brand. The recent mid-life update has made a good car better, given it now has a decent cabin design to complement one of the most entertaining all-round packages in the class. Both are great, but the Ford is greater.